The volatile residue of bergamot essential oil is a natural odour fixative, but problems with coumarins and photosensitizing properties of psoralens (bergapten) are reported. The percentage of bergamottin in the essential oil of C.bergamia of Calabrian origin ranges between 1-2.75%, 5-geranyloxy-7-methoxycoumarin 0.08-0.22%, citropten 0.14-0.35%, and bergapten 0.11-0.32%. 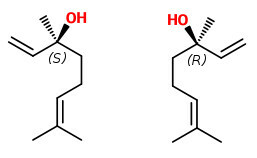 In bergamot peels and essential oils (home-made and commercial), the (R)-(+)-enantiomer of limonene dominated (98-100%), whereas linalool and linalyl acetate occure as optically pure (R)-(-)-enantiomers. Limonene occurred as an optically pure (R)-(+)-enantiomer in bergamot flesh, while linalool and linalyl acetate were not detected. The 3-hydroxy-3-methylglutaryl neohesperidosides of hesperetin (brutieridin) and naringenin (melitidin), isolated from the fruits of bergamot, were identified to be structural analogues of statins, lipids concentration lowering drugs that inhibit 3-hydroxy-3-methylglutaryl-CoA reductase (HMGR).